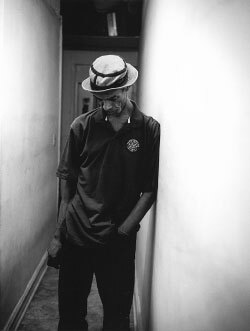 I ain’t saying I didn’t invent rapping,” says Gil Scott-Heron. “I just cannot recall the circumstances.” For a man who’s missing a few teeth and the hairs on top of his head, and who lost a decade and a half of his life to a cocaine habit that landed him in jail a few times, he seems pretty happy. Sitting on a threadbare couch cluttered with used lottery tickets and a pile of papers in the Harlem railroad apartment he’s lived in since 1999, Scott-Heron, 59, is laughing as he listens to a country-folk version of his song “Whitey on the Moon” (“Isn’t that a kick in the head?” he says) and talking about the future. There’s a faded poster of Muhammad Ali by the front door, and a skinny gray-and-white cat named Paris roams the windowsill looking out over the concrete courtyard. After not recording a studio album in fourteen years, Scott-Heron will be performing with the Mos Def Big Band June 28 at Carnegie Hall. He’s best known for his 1970 polemic “The Revolution Will Not Be Televised” and a few hits (“Johannesburg,” “The Bottle”). His songs have been widely sampled by Kanye West, Common, and Tupac and are even featured in Grand Theft Auto IV. “His example has been a profound inspiration to me and so many others,” says Princeton’s Cornel West, “in terms of fusing the musical with the prophetic and being willing to take a risk or pay a cost in order to lay bare some unsettling truths with such artistic sophistication.” Among those unsettling truths was his drug abuse, foreshadowed in songs like “Angel Dust” and “Home Is Where the Hatred Is” (“Home is where I live inside my white powder dreams / Home was once an empty vacuum that’s filled now with my silent screams”). When he was facing possession charges in 2001, an ex-girlfriend wrote a letter to a state judge claiming that Scott-Heron spent $2,000 a week on cocaine and lived in a crack house for a year. She also said he took out all the lightbulbs in his apartment because he thought he was being spied on. (He denies her claims.) He was paroled early in May 2007 after serving ten months for violating a plea bargain at the upstate Collins Correctional Facility, but he was picked up for a parole violation last October. Now out on parole again, he says he’s trying to stay clean (“I’m doing my best”), but he remains unrepentant. “I had some cocaine in my pocket. They should have left me alone,” he says. “In England, they would have took it and gone on home.” He’s been HIV-positive for several years and says his health has improved, but he recently was hospitalized (he jokes, “the old one was all used up, so they gave me pneumonia”). He’s lost weight recently; his black jeans barely hang on to his hips. He still smokes, Marlboro Reds.